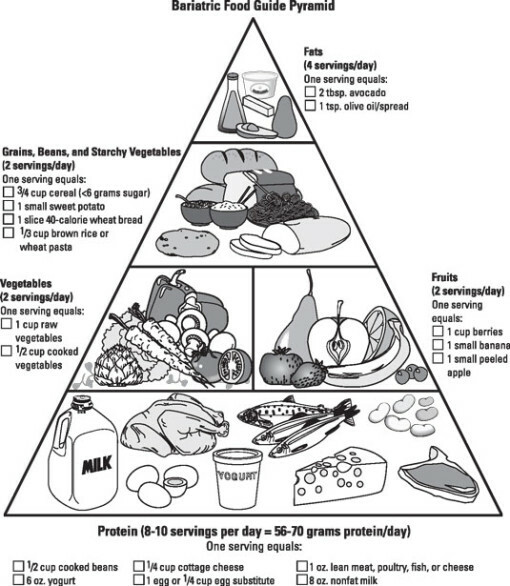 After your weight loss surgery, you can use the bariatric food guide pyramid to help you design your own menus in the recommended portion size. Remember, the portion sizes are recommended as the limit. Listen to your body and stop when you are satisfied! Initially you need to weigh or measure all of your food in order to learn how to take care of your pouch. But as time goes on, measuring is still important. Researchers estimate that most people underestimate their portion sizes by as much as 25 percent, which can really add up. Stay honest with yourself about the calories you take in. A time will come when you think you know what 3/4 cup of cereal looks like in your bowl and you don’t have to measure each time. However, should you become that confident, at least check yourself periodically to make sure you’re not experiencing the dreaded “portion creep.” And if you eat from a bowl that measures one cup, it will be easier to monitor portion sizes. The Japanese have a saying: hara hachi bunme, which means “eat until you are 80 percent full.” If you take smaller bites, eat slower, and use internal cues instead of external ones, you’ll enjoy your food more and feel satisfied sooner. Your surgeon or dietitian will recommend a calorie level for you to adhere to, and it varies from practitioner to practitioner. Men may be put on a general level of 1,300 to 1,500 calories and women at 1,200 to 1,400, or your surgeon may have you breathe into a small machine to see how many calories you actually require a day. Whatever the case, follow the recommendation. Some plans don’t allow any pasta, rice, bread, or potatoes — ever. Again, please follow your surgeon and dietitian’s recommendations. No liquids are included in the meals. To keep from overfilling your pouch, you need to continue to observe the “no drinking with meals” rule. Stop at least 5 to 10 minutes before you eat, and do not drink for 30 minutes after you finish. You may also have noticed there is no junk food in the menu. Remember, because you can’t eat as much, it is very important that the foods you eat are nutrient rich. Foods like the ones in the menu above give you more nutrition bang for your calorie buck! You are not required to finish your meals. Listen to your body, and don’t eat until you feel pressure or fullness in your chest or abdomen, signaling you may be ready to vomit. You may have times when you simply aren’t hungry (and you may really enjoy that feeling), but don’t skip meals or forget to eat. You need to get enough nutrients so you stay healthy. And believe it or not, not eating enough can also slow down your weight loss. When you don’t eat enough calories, your body goes into self-preservation mode and becomes much more efficient at hanging on to the fat it already has.